Life is always filled with push and pull... Of decisions you make, emotions you have, things you want to get done. 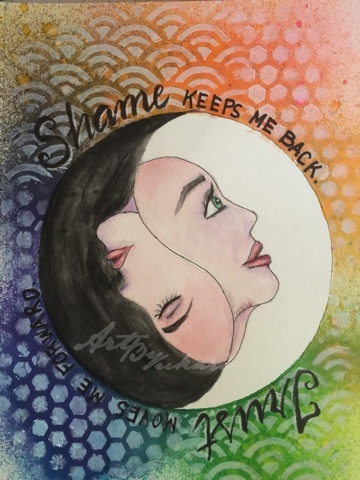 I recently read a blog post by a friend who talked about a decision he made in which he had to fight the shame he felt making this decision and instead trust his instincts to know he made the right decision. At the end of his post, he wrote. "Shame keeps me back. Trust moves me forward." 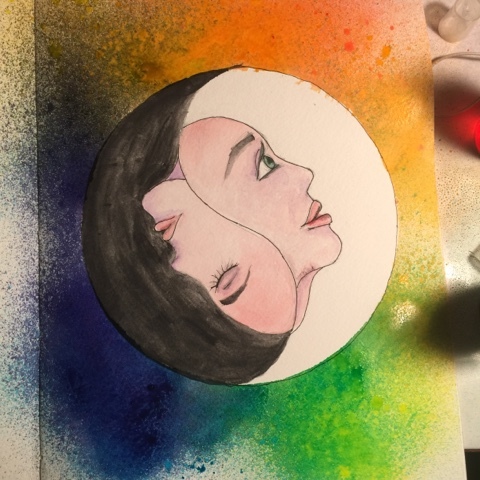 As often the case, words inspire images in my mind and I immediately saw ying and yang, faces that show shame and trust. So I sketched. I wasn't quite sure how to color this but when I made my ink sprays with food coloring, I decided to use these sprays for the background. 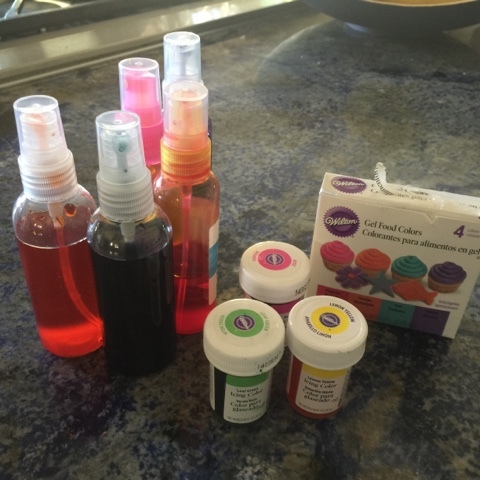 If you are interested in making these sprays, you'll want to use gel food colors. Wilton makes vibrant icing colors! Of course these get used in icing too! The colors are so vibrant, I wanted to tone it down a bit so I stenciled over the page with white gesso. 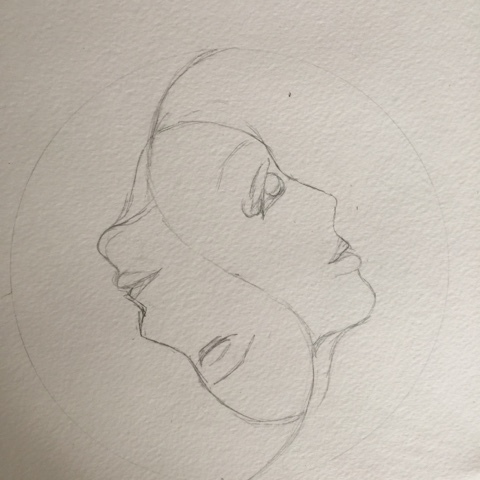 By the way, I cut a circle to use as a mask for spraying and stenciling and I will be able to use that later! And finally, the completed piece with lettering. Matt's quote struck a chord with me because shame used to keep me back from doing so much and I'm just beginning to trust my instincts, my abilities. This is wonderful, Angelcake! That Matty is such an inspiration in so many things. He probably doesn't realize how much. May your weekend be awesome, Ms Kari! I love the background with the stenciling. Very cool. This is Gorgeous & so appropriate! Love back stories & techniques used to make great art. Thank you for sharing with us. Matt & the boys are so inspirational! Really lovely. And I love the inspiration behind it. I'm going to tell me very artistic little sister about the food dye sprays, too. They make a great background.